So… I had to make my own birthday cake… again. I’m not complaining though. I always make my own birthday cake. I actually like to do it because I love baking (LOVE IT) and, since it’s my birthday, the only person I have to please is me. Every year I have the same birthday cake: yellow cake with chocolate frosting. It is my all-time favorite. This year I shocked everyone by making a new type of cake; a peanut butter chocolate chip cake because, really, what is better than peanut butter and chocolate? I got a recipe ages ago for Sprinkles’ peanut butter chip cupcakes. I made it ages ago and had great results, but I hadn’t made it since we made the switch to gluten-free. I used that cupcake recipe as a jumping off point and let things sort of takeoff from there. I winged the frosting, using a bunch of ingredients that I liked and hoping that it wouldn’t end in disaster. I was very pleased with the end results. I like a cake to have sort of a rustic look, but since this was a birthday cake, I wanted to do something to make it special. Sprinkles tops their peanut butter chip cupcakes with chocolate sprinkles so, in keeping with that theme, I topped the cake with chocolate shavings. Voila! My 2012 birthday cake was born! I had a wonderful birthday and I enjoyed my cake very much. 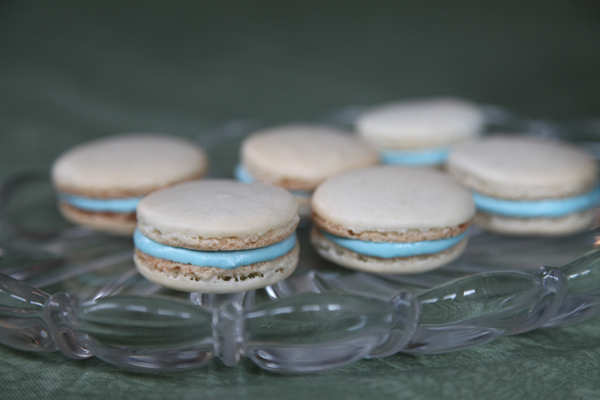 I had leftover egg whites from another recipe so I also enjoyed a batch of macarons (which I, unfortunately had to share… they were that good). In a medium sized bowl, mix together the flour, xanthan gum, baking powder, baking soda and salt. In the bowl of an electric mixer on medium speed, cream together butter, peanut butter, brown sugar and sugar. Add eggs, vanilla and milk. Add the flour mixture in batches until fully incorporated. Bake at 350 degrees Fahrenheit for 30-40 minutes or until tester inserted into the center comes out clean. 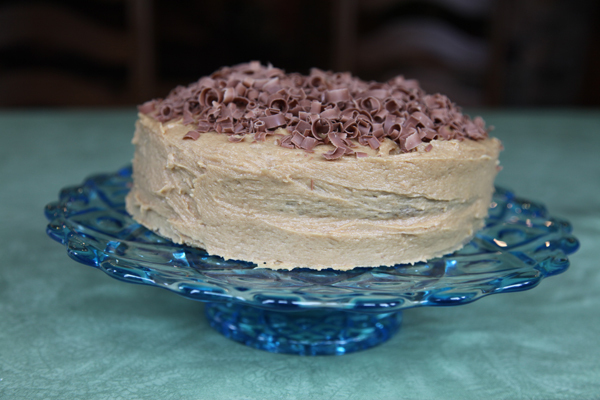 Cool completely and frost with peanut butter frosting and top with chocolate shavings. I know what you’re thinking… Peanut butter and cream cheese? But it works, I promise. This is also really good on graham crackers and apple slices. In the bowl of an electric mixer, cream together butter, cream cheese and peanut butter. Add 2 cups powdered sugar, salt and vanilla. Add up to remaining 1 cup of powdered sugar or whole milk, 1 Tablespoon at a time until desired consistency is reached. 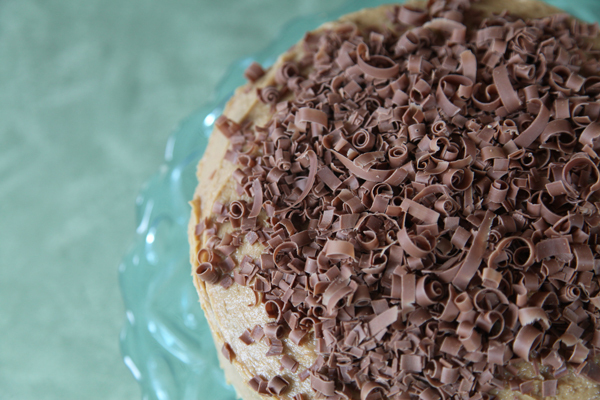 Using a potato peeler, shave the end of the chocolate, making chocolate curls. Scatter evenly on top of the cake. I made your birthday cake recipe yesterday for my peanut butter-loving, gluten-free husband’s birthday and it turned out great! I am usually disappointed when I bake anything gluten free, but this cake actually looked and tasted like a (full of gluten) birthday cake! I cut the frosting recipe in half to save a few calories and it was so loaded with peanut buttery goodness already that no one could even tell. Thanks for the recipe; it will be saved with my few successful gluten-free baking recipes and will no doubt be made again! I am so glad to hear that it turned out!